"Earns top marks for easy installation and excellent customer service." "For less than $150, you can enjoy drinking water that tastes better." "Fits under a standard kitchen sink so it won't take up counter space." "Has 7 stages of treatment, including an 11-watt UV light." "Has a similar footprint and appearance similar to a pod coffee maker." "Saves your cabinet space and won’t require any drilling." "Offers full contact purification, re-mineralization, and fast dispenser action." "Received gold certification for removing up to 99 percent of contaminants." "The water has been freshly filtered and hasn’t been sitting in a storage tank." 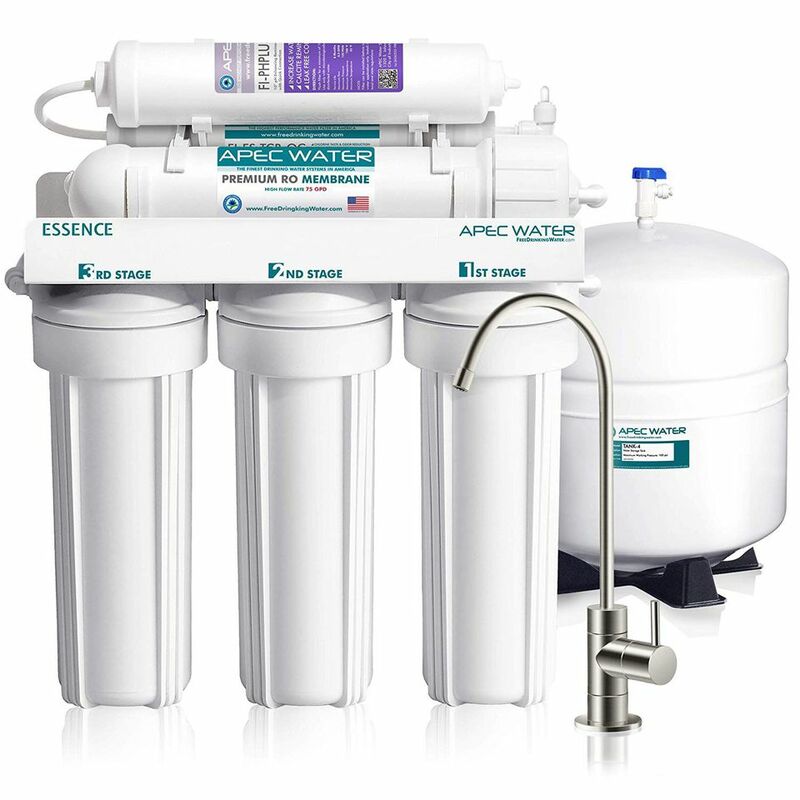 Sip on pure, clean water with the addition of the APEC Ultimate 6-Stage Reverse Osmosis Water Filter System for home. This reverse osmosis system is easy to mount under the sink and earns top marks for easy installation and excellent customer service. With super capacity filters, you only need to change the filters once a year to enjoy fresh, clean water every day. The APEC Ultimate 6-Stage Reverse Osmosis system removes up to 99 percent of bacteria, contaminants, and solids. But it also adds back in calcium and magnesium, which are beneficial minerals for your health and improve the taste of drinking water. The system is rated for purifying up to 75 gallons per day, which is plenty for the average family’s daily needs. The system includes a flow restrictor and an automatic shutoff valve that help to reduce wastewater to 3 gallons for every 1 gallon of purified water produced. Some other systems produce in excess of 5 gallons of wastewater to every 1 gallon of purified water. Since this is an under sink reverse osmosis system, you’ll need to set aside space for the 4-gallon pressurized tank—which measures 11 inches wide and 15 inches tall. Giving up your cabinet space will seem worth it though when you taste the purified water from the system. In fact, 95 percent of reviewers give this system 4 stars or better. While nearly everyone loves the taste from this water filtration system, a few people tested the pH and complained that it wasn’t as alkaline as they hoped for in a system that adds back beneficial minerals. However, the company points out that the pH filter will raise acidity by 1-1.5 levels, so the final pH will depend on the chemistry of the water that you’re starting with. For less than $150, you can enjoy drinking water that tastes better and is clean from contaminants. If you add up how much you’re spending on bottled water to achieve the same result, you’re likely to break even quickly with the affordable PureDrop Reverse Osmosis Water Filtration System. This system can purify up to 50 gallons of water per day and has 5 stages of filtration to remove up to 99 percent of TDS. For every gallon of purified water produced, there are 3 gallons of wastewater. This is an average conversion rate and is much better than some water filtration systems that have 4 or 5 gallons of wastewater for every purified gallon produced. People find the PureDrop Reverse Osmosis System to be easy to install, thanks to color-coded tubing and connections. While it isn’t the most robust reverse osmosis system on the market, just about everyone is happy with the quality of water it produces—and the price tag won’t leave an unpleasant aftertaste! If you’re looking for an under sink reverse osmosis system, the iSpring RCC7AK is a top choice that is WQA Gold Seal certified and moderately priced without sacrificing performance or quality. Like most under sink reverse osmosis systems, you’ll need to clear enough space for the 3.2-gallon pressurized storage tank and the filter cartridges. But once you do, you’ll find that the rest of the installation is easy according to most reviewers. One user mentions that they move every 3 years but are happy to uninstall and re-install the system in each new residence due to the high performance and easy set-up of the iSprings RCC7AK. The reverse osmosis membrane used in the RCC7AK is rated for up to 75 gallons per day, which is plenty to meet the needs of most households shopping for an under sink reverse osmosis system. It takes anywhere from 1 to 3 hours to fill the storage tank, but once the tank is full, you’ll have purified water ready and waiting under the sink. A lead-free brushed nickel metal faucet for countertop installation is included so you can bypass the tap and have fresh, clean water on demand. If your home takes advantage of a natural well, you can use a reverse osmosis system to make sure that the water you’re drinking is safe and pure. The iSpring RCC7AK-UV is a top choice if you’re shopping for a reverse osmosis system for well water. This water filtration system has 7 stages of treatment, including an 11-watt UV light to zap any microorganisms that may be lurking in well water. While this isn’t usually a major concern for homeowners on municipal water, the conditions of a well sometimes harbor bacteria and microorganisms that could pass through your plumbing and into your glass. A UV sterilizer is an efficient, effective way to eliminate this risk and have more peace of mind when drinking well water. The reverse osmosis membrane of this system is equipped to process 75 gallons of water per day. Like other popular iSpring reverse osmosis systems, the RCC7AK-UV can easily be mounted under the sink. For the greatest peace of mind when drinking well water, take advantage of the purification power of reverse osmosis combined with the sterilization of UV light in this water filtration system. No matter what you call home, you want access to purified water that is free of contaminants. If you’re looking for a reverse osmosis system for apartment use, or in another small space like a condo or RV, then check out the space-saving ZIP Countertop Reverse Osmosis Water Filter. The Zip has a similar footprint and appearance similar to a pod coffee maker, but instead of serving up java, this mighty machine delivers purified water. Pour tap water into the reservoir and the Zip will give you a 0.5 gallon of filtered, pH-balanced water in about 15 minutes. Just keep in mind that you’ll need to empty the tank of purified water before you can add water to the fill-up tank for another round of filtration. People love the quick, easy operation of the Zip Reverse Osmosis Water Filter and the fact that they don’t have to install anything or run hoses to the tap. The convenience of a reverse osmosis system for apartments doesn’t come cheap though—the machine costs just under $475. Still, this is one of the sleekest, most portable reverse osmosis systems we’ve seen. Whether you’re a renter or looking for a mobile water filtration system, the Zip is a great choice. Most reverse osmosis systems require you to do a bit of under-sink installation and drill a hole for a separate dispenser, but you can also opt for a countertop model that saves your cabinet space and won’t require any drilling. The APEC Portable Countertop Reverse Osmosis Water Filter System can be set up quickly and easily with no permanent installation necessary. This countertop reverse osmosis system sits in close proximity to your sink faucet and the filters are connected to the tap through several tubes. It’s important to know that this system can only be used with a standard kitchen faucet—designer models, spray heads, or pull-out versions won’t work. If you’ve made room on your counter for this water purifier, you can at least conceal the filters by purchasing a model that comes with a white snap-on case. But no matter whether you go with a case or not, you will have to live with tubes running to the faucet. The APEC Countertop Reverse Osmosis System isn’t the most budget-friendly or discreet water filtration system you can find, but it might be the right choice if you can’t install an under-sink water purification system. Surprisingly, the reverse osmosis filter for this compact unit is rated for purifying up to 90 gallons of water per day. For a purified glass of drinking water in a hurry, the Home Master TMAFC-ERP Full Contact Reverse Osmosis Water Filter System is hard to beat. This top quality reverse osmosis system offers full contact purification, re-mineralization, and fast dispenser action. One of the most frequent compliments of the Home Master Full Contact Reverse Osmosis Water Filter System is that it delivers great water pressure when compared to other reverse osmosis kits. This can be credited to the permeate pump along with the 3/8” dispenser tubing used in this system, which results in a faster flow of water than the typical ¼” tubing found on many other reverse osmosis systems. Like most reverse osmosis water filtration systems, there will be some audible noise when the system is filtering water—but it shouldn’t be distracting. If it is, something may have gone wrong during installation. Fortunately, most people find the installation to be straightforward and customer support to be stellar if there is a problem. More than 90 percent of reviewers give this reverse osmosis system a five-star rating. It isn’t the most affordable system, but it does reduce wastewater compared to many other systems. For every 1 gallon of purified water, there is just 1 gallon of wastewater, thanks in part to the permeate pump. Maintenance is easy for this reverse osmosis system—you’ll only need to change the filter once per year or every 2,000 gallons. So pour yourself a glass of clear, clean water and drink with peace of mind thanks to the Home Maker Full Contact Reverse Osmosis System! While many reverse osmosis systems are rated for purifying 40 to 75 gallons of water per day, the APEC High Output Reverse Osmosis Water Filter will deliver up to 90 gallons of fresh, purified water per day. This high output reverse osmosis system is part of APEC’s Ultimate line of water filtration systems and has earned 4-stars or better from 96 percent of online reviewers. It has also received gold certification from the WQA for removing up to 99 percent of contaminants. For this unit, the wastewater to purified water ratio is about 3:1. Users often comment on how quiet the water filtration system is and what a difference it has made in their water quality. One homeowner with dangerous, elevated levels of arsenic and radon reports that this APEC reverse osmosis system reduced the presence of these contaminants in her drinking water to nearly nothing. To keep the system running at optimal efficiency, you’ll just need to change the filters once per year. The long-life of these super capacity filters is another big selling point for this high output water filtration system. If you prefer to have your purified water ‘on demand,’ then a tankless reverse osmosis system might be your best bet. The pricey but capable iSpring RCS5T Tankless Reverse Osmosis Water Filter System has 5 stages of filtration and, like most reverse osmosis options, it will remove up to 99 percent of TDS. What’s unique about the tankless design of the RCS5T is the fact that each time you fill a glass with water or a pot for cooking, the water is purified on demand. As a result, you may notice that it fills slightly slower and with less water pressure than similar systems, but you’ll know that the water has been freshly filtered and hasn’t been sitting in a storage tank. The booster pump included with this tankless reverse osmosis system requires electricity but helps to maximize the efficiency of the system. It can achieve up to a 1:1 ratio of purified to wastewater. However, in real-world use, some people found that wastewater was more like 2 gallons for every 1 gallon of purified water produced. iSprings points out that many factors affect this efficiency rating, so some variance in results is to be expected. This is a high capacity reverse osmosis system that can be used in a residential capacity or even in a light commercial setting. The reverse osmosis membrane is rated to purify up to 500 gallons of water per day. Our writers spent 4 hours researching the most popular reverse osmosis systems on the market. Before making their final recommendations, they considered 19 different systems overall, screened options from 11 different brands and manufacturers and read over 146 user reviews (both positive and negative). All of this research adds up to recommendations you can trust.